Elegantly packaged in a chic gift box, the Florals gift set was meticulously researched using authentic sources and crafted with only the rarest of ingredients. 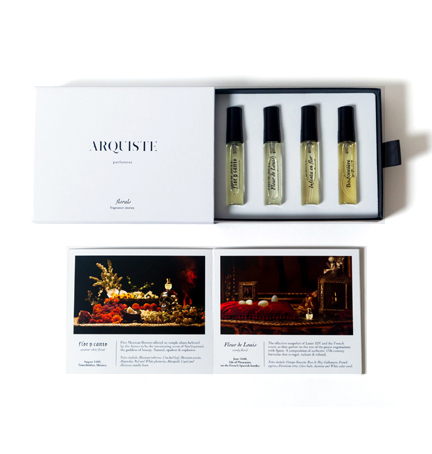 ARQUISTE scents capture history’s most evocative moments for a timeless holiday fragrance experience. While each luxurious ARQUISTE room scent focuses on a place, interior or landscape evoked in one of our fragrance stories, recreating a unique ambiance and mood. Arquiste Florals Gift Set ($70; pictured above): With four delicate fragrances blooming with the finest floral extracts, this collection is the ideal gift for those who prefer light, elegant fragrances. First, Fleur de Louis transports the wearer to the Isle of Pheasants on the French-Spanish boarder in 1660, where young Louis XIV meets his bride for the first time amid a bouquet of Orange Blossom, Florentine Orris, and Jasmine. Experience the feel of his future wife, Maria Theresa of Spain, with Infanta en Flor, featuring bright Orange Flower Water, rich Spanish Leather, and Immortelle. Then, experience the heat and passion of an Aztec festival in the summer of 1400, featuring intoxicating Mexican tuberose, Plumeria, and the sacred Marigold with Flor y Canto. Finally, a duo of Gardenias, or “Opera Flowers,” shine against the scent of Italian Mandarin and Bergamot in Boutonnière no. 7, set in Parisian opera house Opéra-Comique in 1899. Arquiste Room Scents ($85): Available in a variety of scents, ART DECO VELVET was inspired after several wonderful visits to the smartest of Mayfair smoking rooms and cocktail bars. The exotic wood and leather paneled walls, the Lalique glass detailing and the velvet banquettes have soaked in years of redolent smoke and powdery, ambery rich perfumes. The most comfortable, elegant cocoon of a space. The scent’s irreverent aromatic and citrusy notes of the gin martini contrast with the soft vanilla blond tobacco and a dry woody background that is perfect for any ambiance. DARK GALLEON focuses on the moment of disembarkation, when the merchant galleon arrives in Nagasaki, the South Island port city where the Spanish and Portuguese had set up camp for trade with the Japanese. The pitch black hull of the galleon was saturated with the scent of spice barrels and trunks full of leather. The smokey notes of tar and cade wood give a mysterious, hypnotizing allure, like dying embers in a bonfire. MEXICAN BAROQUE captures the scents that fill the kitchen, blending cocoa absolute, Mexican vanilla, and smoked chilies together with cedar wood and red clay. Deep in the heart of Mexico City in 1695, a group of nuns gathers together in the kitchen to concoct a cherished recipe. Blending together rich chocolate and spices in earthenware pots, the Sisters brew a hot cocoa recipe that had become well known all over the Viceregal city.